Hss A-S. 2011. Glossy Swiftlet Collocalia esculenta stealing nesting material from Baya Weaver Ploceus philippinus nests in Perak, Malaysia. Birding Asia 16:78-80. Dr Amar-Singh Hss photographed a Glossy Swiftlet stealing nest materials from the nest of a Baya Weaver in Ipoh City, Perak, Malaysia. He observed this behaviour at two colonies between May 2009 and April 2010. the first site was in the Bercham area at a housing estate where there was a Baya Weaver colony of 8-10 nests. The swiftlet flew past at a nest with chicks and pulled out bits of grass, sometimes landing on the nest. A year later the same behaviour was seen at the same colony, and also at a second weaver colony 5-6km away. 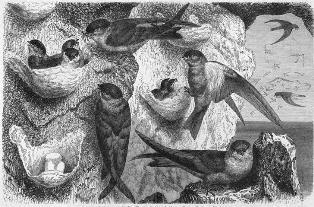 Glossy Swiftlet nests are usually built of filamentous lichen, rhizomes and roots of small epiphytic plants and moss. This story, with photos, also appeared here.